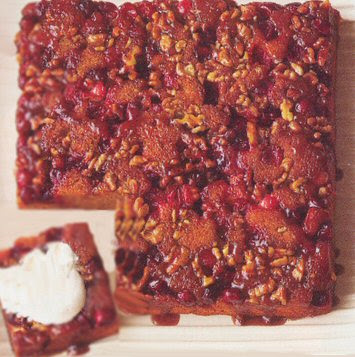 A delightful cake to serve in Winter, if you have not got fresh cranberries then soak dried cranberries in a dry sherry overnight. If you do make it kid friendly then use orange juice. Grease a nine springform baking tray. Boil the brown sugar and butter in a small saucepan until the butter has melted.Pour into the springform and sprinkle with cranberries and walnuts. Cream the butter and sugar together until pale, add the eggs and beat well. In a small bowl, combine the sour cream, pumpkin and vanilla extract and fold in with a plastic spatula. In another small bowl, combine the dry ingredients; add to creamed mixture alternately with sour cream mixture. Spread the batter on the cranberry mixture in the pan. Bake for 40 minutes or until a toothpick inserted near the centre comes out clean. Cool for ten minutes then place a plate over the cake tin and invert, serve the cake warm from the oven with plenty of cream or crème fraiche.